Chicago City Hall is the official seat of government of the City of Chicago in Illinois, United States. Adjacent to the Richard J. Daley Center and the James R. Thompson Center, the building that includes Chicago City Hall houses the offices of the mayor, City Clerk, and city treasurer of Chicago; some city departments; aldermen of Chicago's various wards; and chambers of the Chicago City Council on the west side of the building. The building's east side (called the County Building) is devoted to the various offices of Cook County. Situated on a city block bounded by Randolph, LaSalle, Washington, and Clark streets, the 11-story structure was designed by the architectural firm Holabird & Roche in the classical revival style. The building was officially dedicated on February 27, 1911. 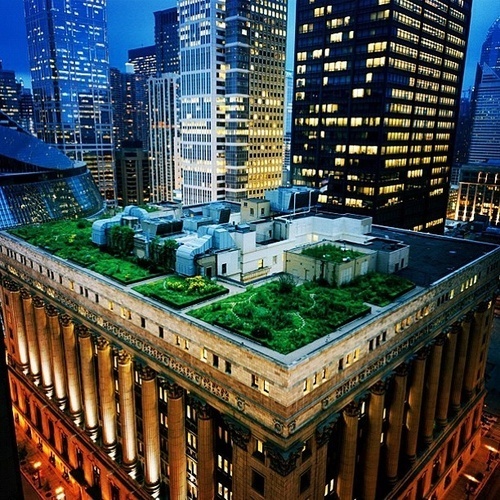 In 2001, the roof gardens were completed serving as a test for the impact green roofs would have on the heat island effect in urban areas, rainwater runoff, and the effectiveness of differing types of green roofs and plant species for Chicago's climate. Noted "green" architect William McDonough designed the project, which is not open to the public.